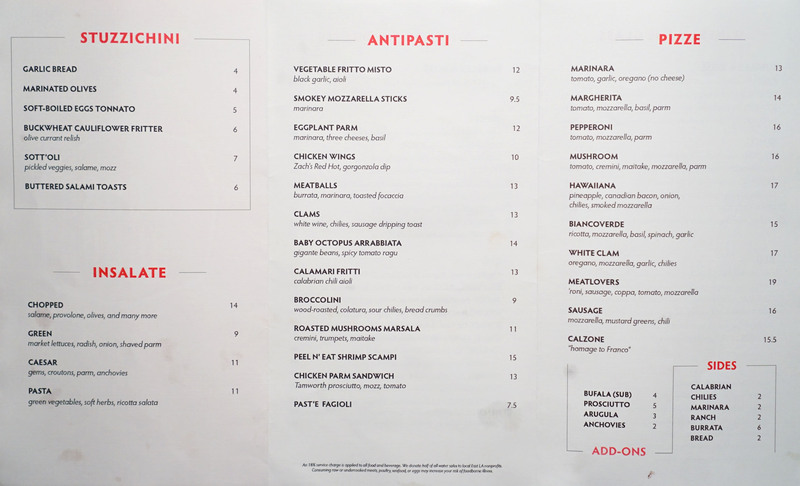 We last caught up with Zach Pollack in July 2014, not long after he opened his first solo project: Alimento in Silver Lake. 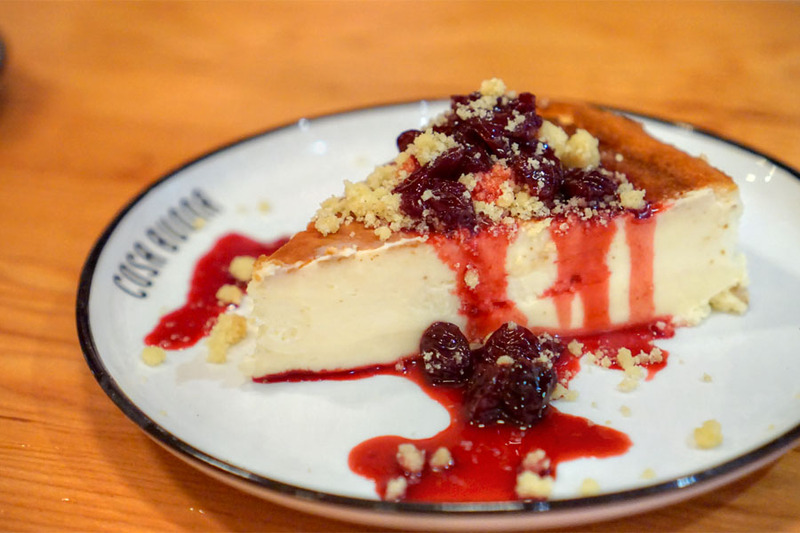 The Chef has now followed up with Cosa Buona ("good thing"), an Italian-American-inspired, pizza-focused eatery in nearby Echo Park that debuted on May 25th. I was looking for a casual dinner spot in the area, and the restaurant fit the bill quite nicely. Running the kitchen for Pollack day-to-day is Chef de Cuisine Zach Jarrett, who previously spent time at Alimento, Sqirl, Salt's Cure, and Lucques. He's also a partner in the upcoming Psychic Wines in Silver Lake. 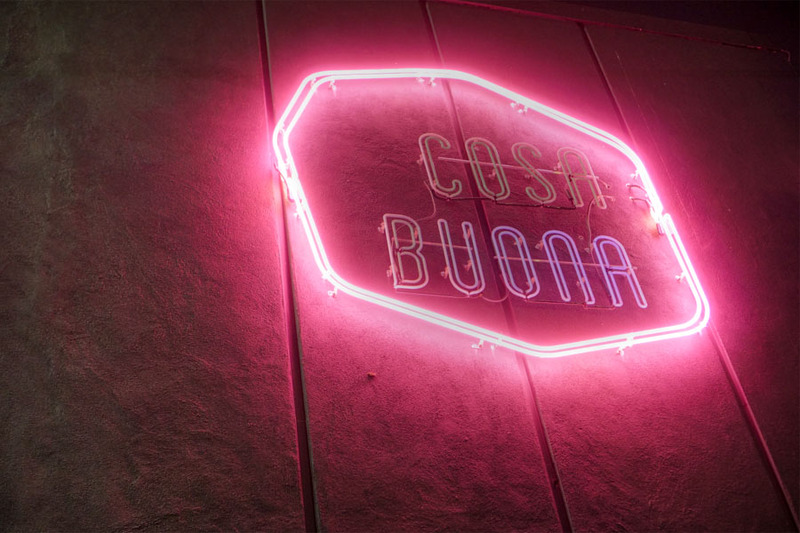 Cosa Buona takes over the former home of the longstanding Pizza Buona, which shuttered in December 2015 after being in operation since 1959 (it re-opened in September 2016 just down the street). It's a pretty cozy space, featuring a handful of tables in the front and three comfortable six-seater booths across from the bar. 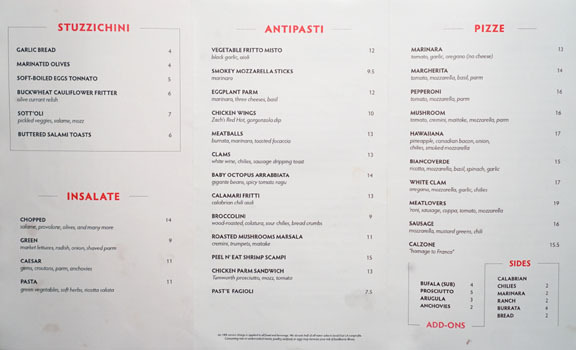 Menu-wise, you basically get revamped versions of old school Italian-American favorites alongside a healthy selection of wood-fired pizzas. Lunch has been served since the start of June (an abbreviated menu, but one with additional sandwich options), and the restaurant also does takeout and delivery. 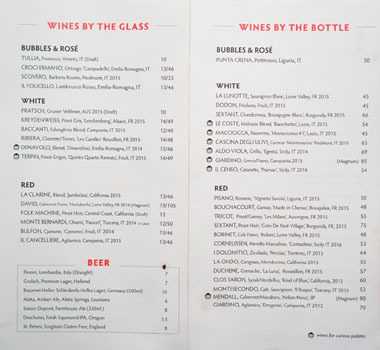 To imbibe, you'll find a mostly Italian/French wine list that's small but interesting, as well as a smattering of beer. 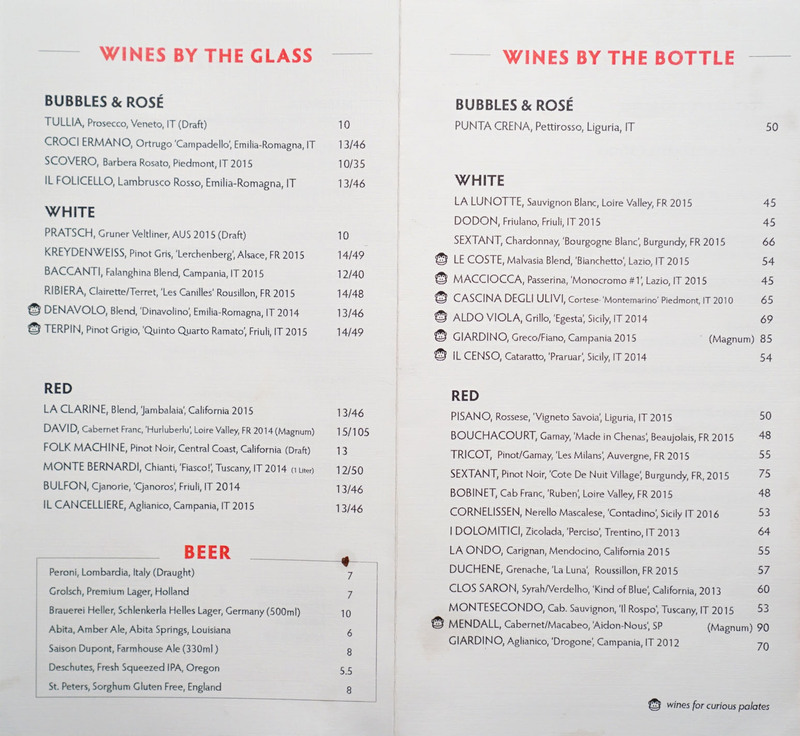 Corkage is $25 a bottle for wine, but only $5 for beer (or possibly higher for large format bottles). Click for larger versions. We began with our sole salad for the night. 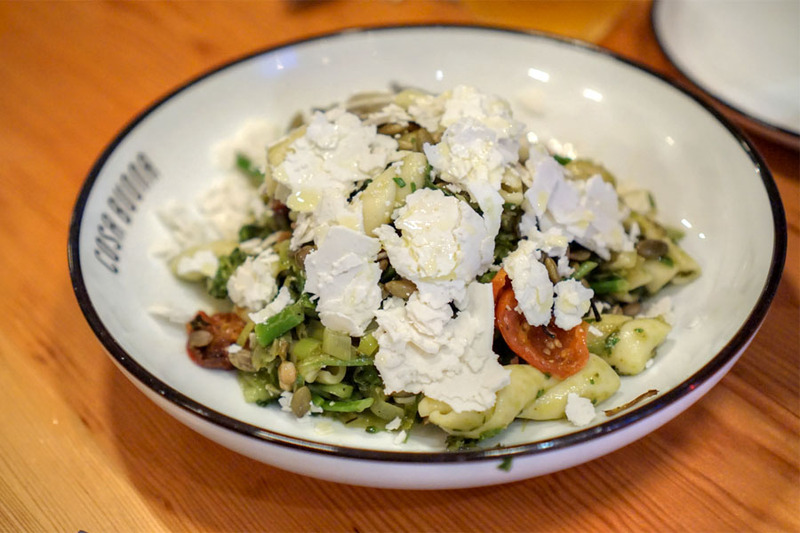 The pasta itself ate just firm enough, and worked well as a stage for all the bright, minty, tangy flavors present. The ricotta imparted some salt to the dish, and I appreciate the nuttiness from the seeds too. A good start. 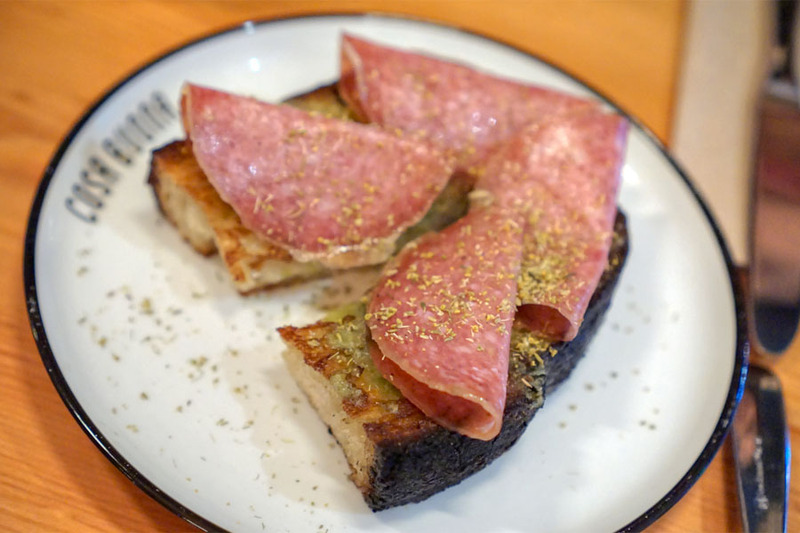 Cuts of salami were rich and spicy, and made sense with their pairing of well-charred toast. We definitely utilized the progressive beer corkage policy, and ended up being charged for only two bottles (we did make sure to share with the staff, though). 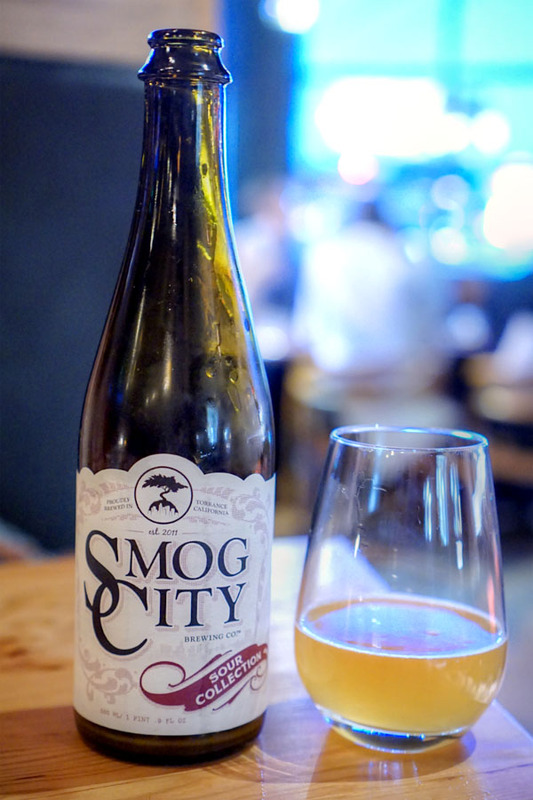 Up first was the 2016 Smog City Brix Layer, a wine barrel-aged sour blonde ale refermented with Riesling grapes. Nose here went in a funky, tart direction, with notes of oak and yeast, while the taste was similarly barnyard-y and sour, with a slightly musty, cider-like quality. Nice. 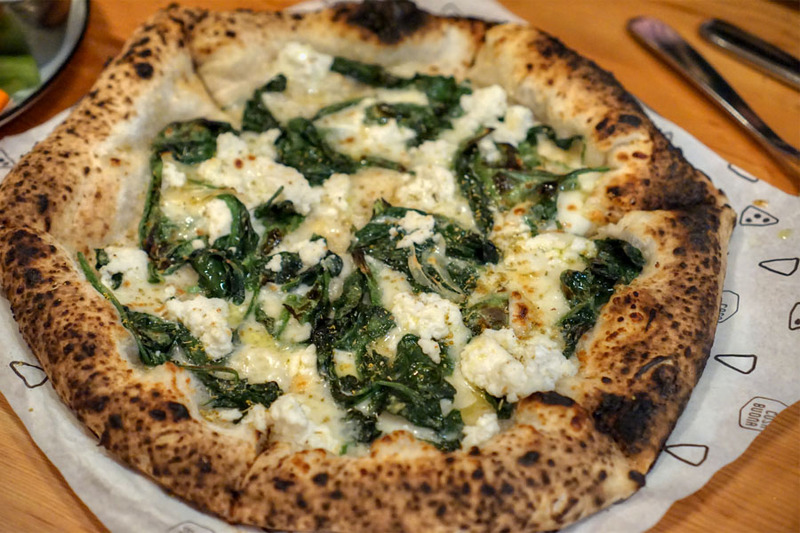 From what I understand, Pollack largely served as the pizzaiolo over at Sotto, so we were looking forward to trying the pies, which are stylistically closer to Neapolitan than what you might encounter at your typical corner pizza joint. 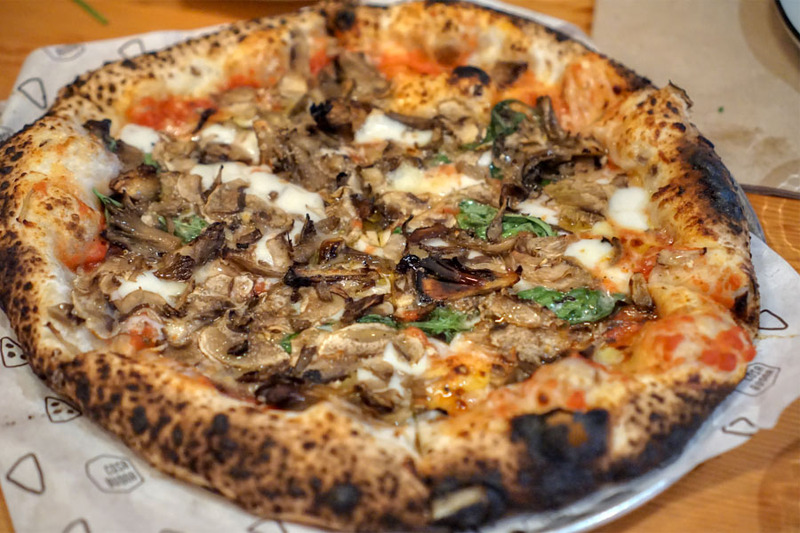 I got some great mushroom flavors here, with plenty of savoriness and woodsiness to go around, well balanced by the cheese and a tinge of bitterness from the greens. The crust, meanwhile, had your requisite leopard spotting, and ate slightly acerbic, with a nice chew. This was lovely. 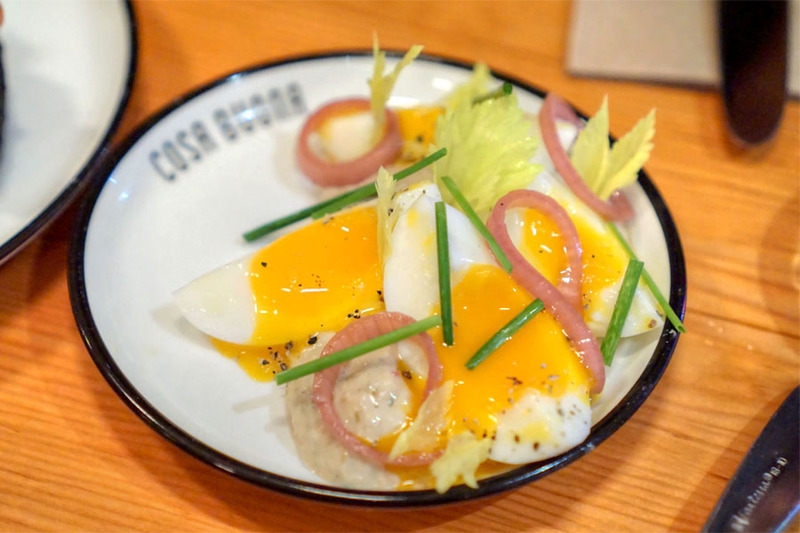 The eggs came out properly runny, their creamy nature working hand-in-hand with the fishiness of that tuna and the bright bursts of acidity from the pickled onion. 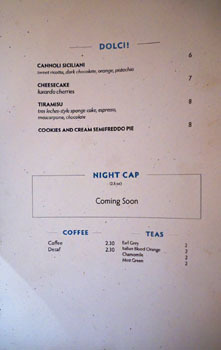 The fritters were fun: wonderfully crunchy, nutty, savory, and deftly complemented by the sweet-tart sauce on the side. 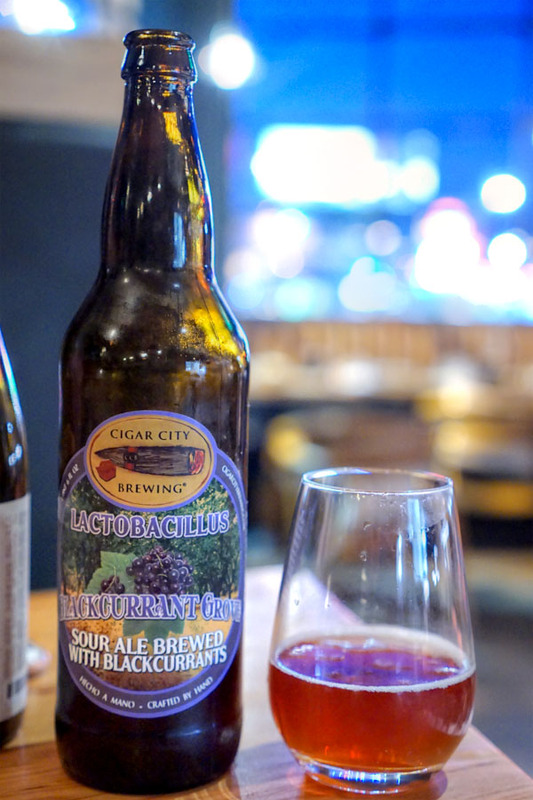 The 2016 Cigar City Lactobacillus Blackcurrant Grove was a sour ale fermented thrice: with Lacto, saison yeast, and blackcurrants. Aromas here were definitely funky, with deep berry notes to boot. On the palate I found it dry, tart, lightly acidic, with a marked vinous quality that made it work with the food. Our second pizza hit the mark as well with its tasty interplay between bitter, aromatic greens and the richness of the two types of cheese, the garlic serving as a fitting exclamation point. 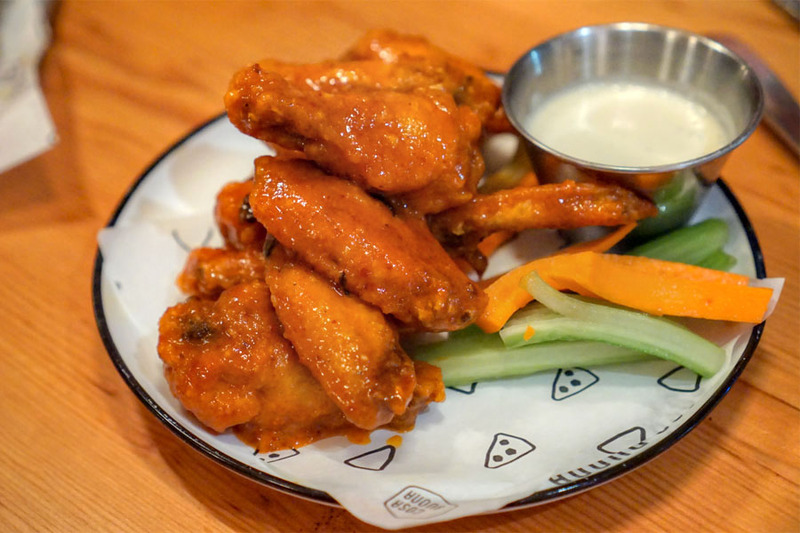 Wings showed off classic, robust, tangy flavors, with a touch of sweetness underneath. Spot on. Polpo arrived tender but snappy, its relative restrained taste really taking on the tangy, spicy nature of the arrabbiata. My favorite thing here, though, was the use of those beans, which did a great job grounding the dish and adding some textural contrast. 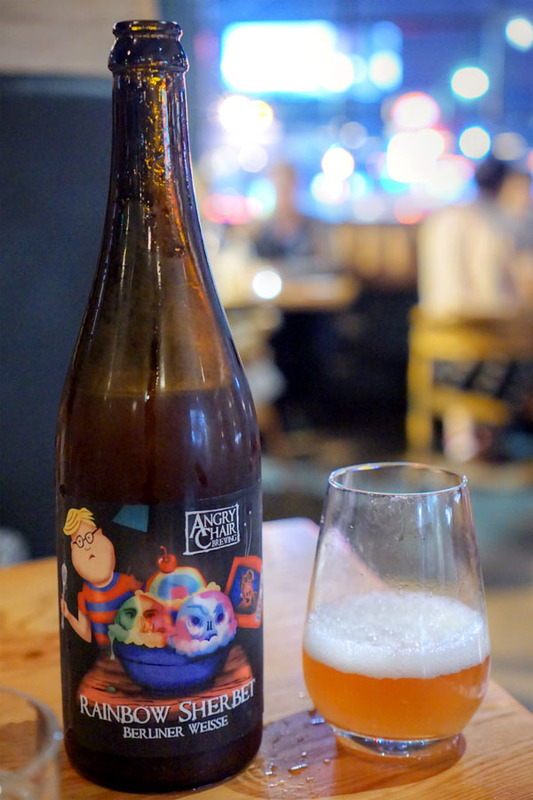 The 2017 Angry Chair Rainbow Sherbet was a fun one. A Berliner Weisse with raspberry, pineapple, citrus zest, and lactose, it really did taste like its namesake dessert, with plenty of tangy, fruity nuances backed by a palpable creamy component. 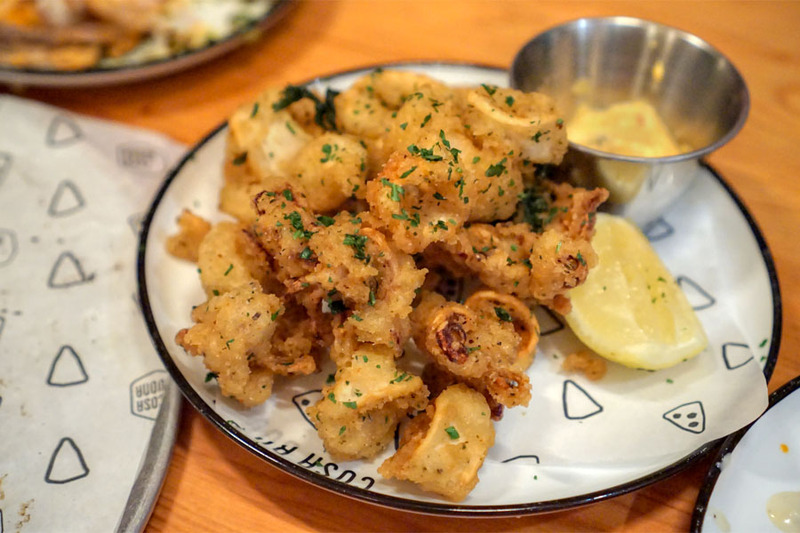 The fried calamari was one of the best preparations I've had, no doubt. The fritters were super crispy, yet light in terms of battering, and also superbly seasoned. 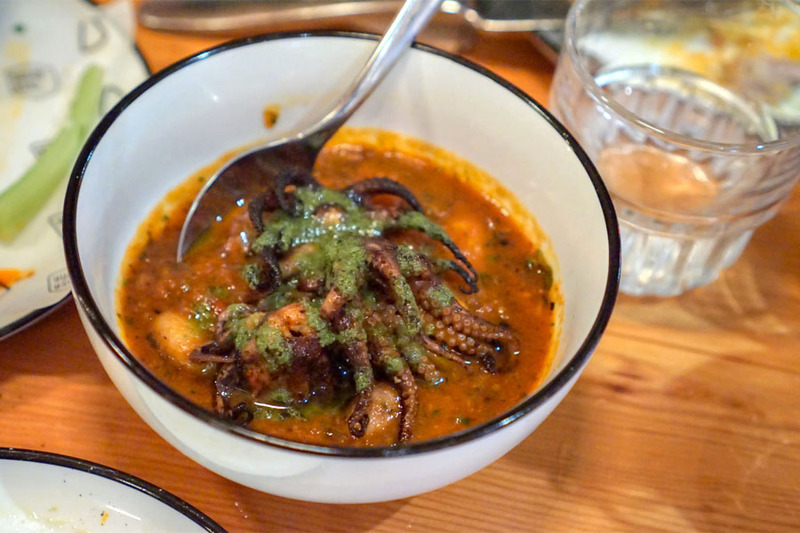 At the same time, the inherent taste of the squid was never overshadowed. The paired sauce was largely unnecessary, though I did appreciate a brush of lemon. 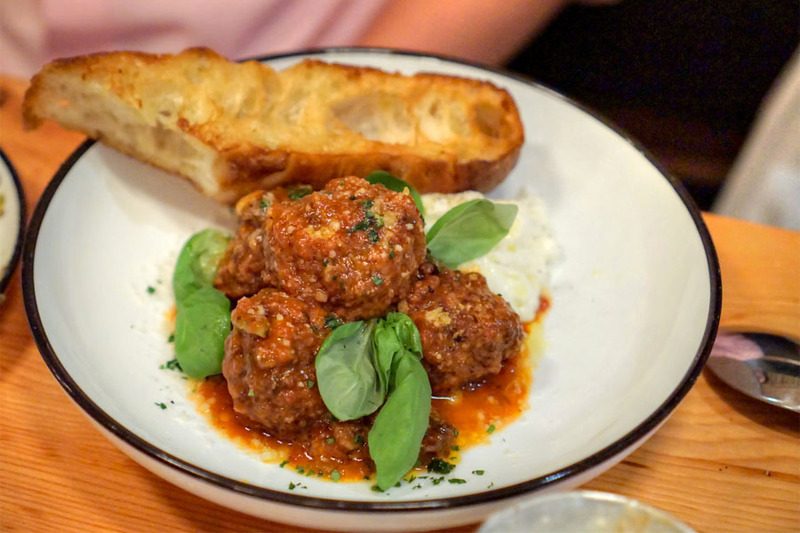 Meatballs were supple and homey, with a super savory flavor profile that actually recalled the nostalgic taste of Slim Jims(! ), curiously enough. Nice counterpoint from the cool, creamy mozzarella too. Calzone [$15.50] | "homage to Franco"
The calzone was probably the biggest I've had, and came stuffed with copious amounts of gooey cheese and bitter greens, the thoroughly seared crust doing an admirable job of moderating everything. Who's Franco though? The four classic-leaning desserts here are the work of Pastry Chef Harriet Han Hayes, who's also responsible for the program over at Alimento. Click for a larger version. 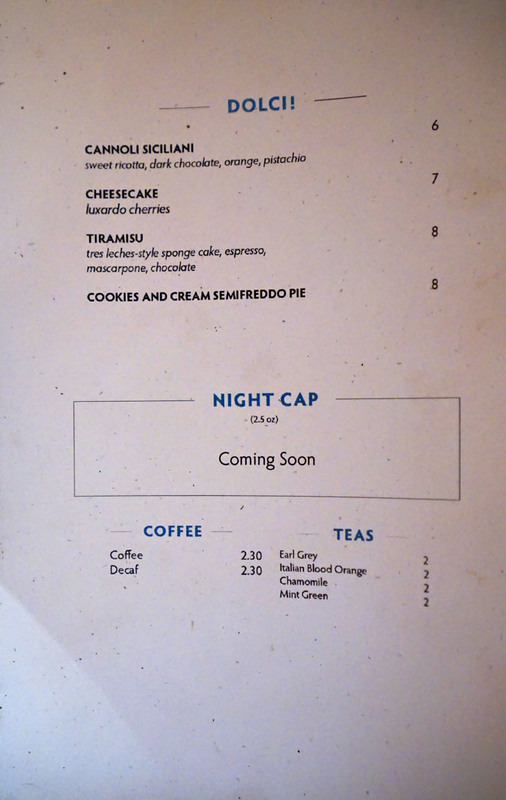 The kitchen ended up sending out three desserts. 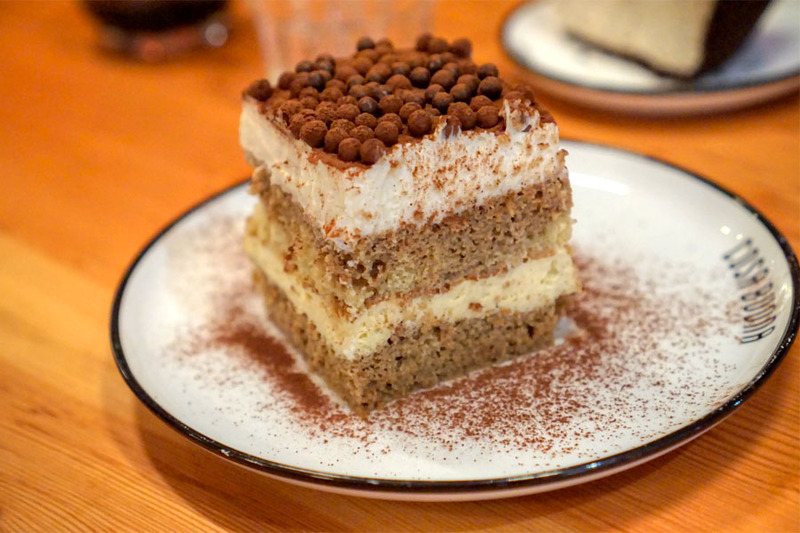 The tiramisu was one of the better versions I've had. In terms of consistency I found it very moist, saturated, yet still light, while the taste conveyed a good balance of coffee, cocoa, and mascarpone. Great crispy bits on top in addition. 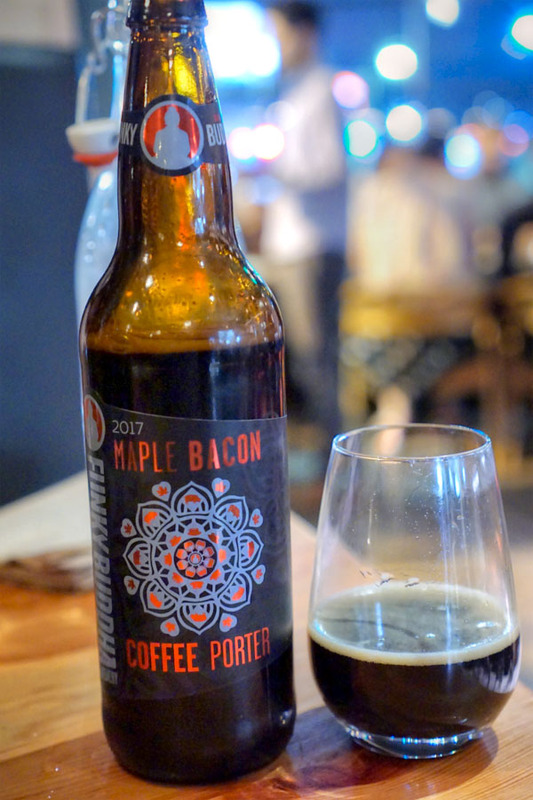 Our final beer was something dessert-y, the 2017 Funky Buddha Maple Bacon Coffee Porter, a porter with maple syrup, bacon, and coffee (not surprising given the name). The nose was smoky to be sure, with strong maple undertones. Taste-wise, it was roasty and coffee-forward at first, then tangy with light maple before finishing with the saltiness of bacon. The torta di formaggio was on point, coming out very creamy, very lactic. The fruit provided a welcomed tartness to the cake, and I liked the little pricks of salt here as well. 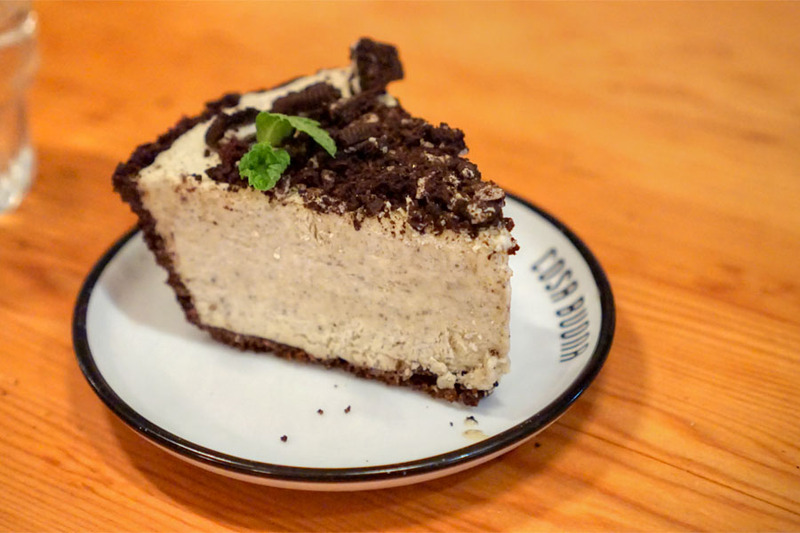 We ended with my favorite of the desserts, which had deliciously classic cookies 'n' cream flavors perked up by a hint of mint. Nice crumbly crust, too. 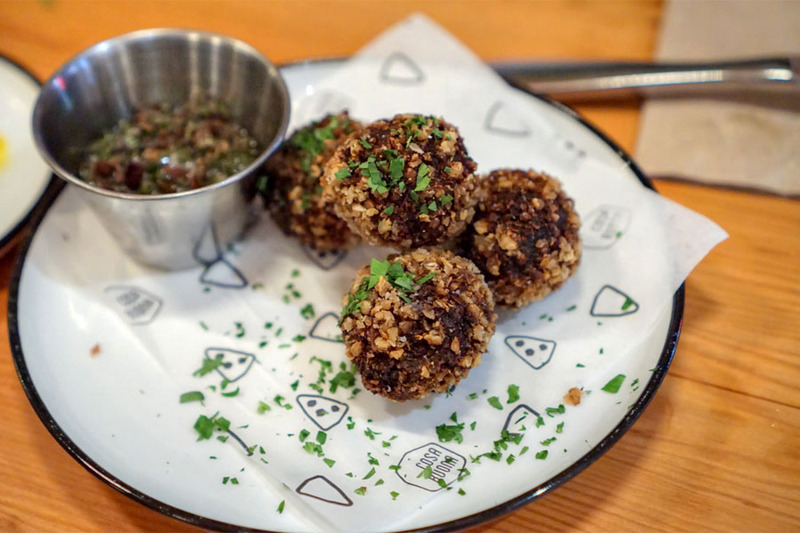 We had a very enjoyable meal at Cosa Buona, and the food really did deliver on its promises of rejiggered "red sauce" fare. The cooking was largely familiar, but with just enough of a twist to keep things compelling. If that wasn't enough, I have to applaud the reasonable beer corkage as well (à la the late Pok Pok), and that's actually reason enough for me to come back. 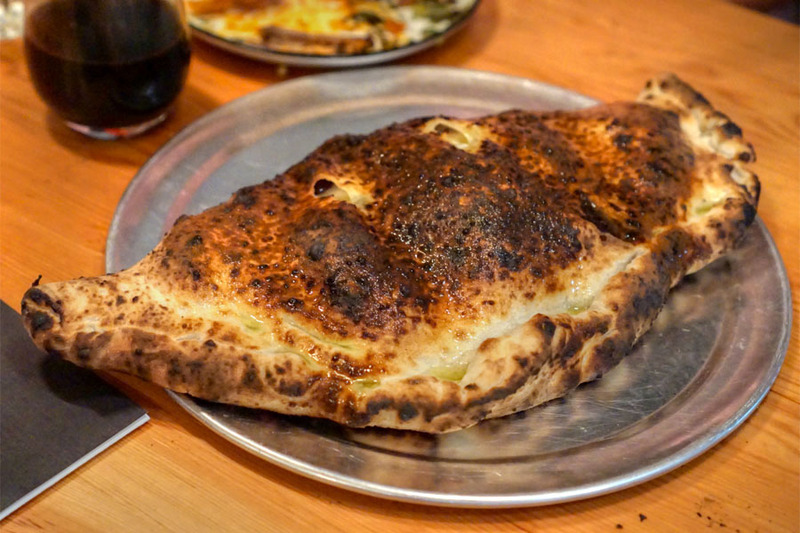 The stromboli is Pollack's homage to master pizzaolo Franco Pepe. Next time you're there, I highly recommend adding the broccolini to your order, the colatura combined with the char and chiles is spot on. Thanks for the calamari intel, I'm dying to try them! Ah thanks for the tip about Franco--looks like the escarole calzone is a favorite of his, so the reference makes sense now. And yep, I wanted the broccolini as well, but we were just too full!